The Halo SB-10 single beam spectrophotometer combines exceptional value with precision spectrophotometry in an uncomplicated package. The Halo SB-10 can achieve a 2 nm spectral band pass for superior spectra and peak resolution with its single beam optics. Other specifications include a wavelength accuracy of 0.5nm, baseline stability 0.002Abs/hr (500nm) and stray light 0.05%T (220nm NaI, 340nm NaNO2). Perform quantitative analyses in either absorbance or transmittance modes and in single wavelengths within a range of 190-1100nm. 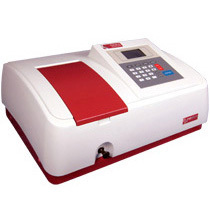 By virtue of the halogen tungsten and deuterium lamps typically found in higher end, analytical spectrophotometers the Halo SB-10s wavelength range is an impressive 190nm - 1,100nm. A dual lamp system also results in higher accuracy than corresponding xenon lamps. Lamp switching is automatic (by default at 340nm) and both lamps are long life. © All rights reserved by Dynamica Scientific Ltd.